From 10 to 14 July 2018 the Port of Sunderland, in the north-east of England, hosted more than 50 sailing ships ahead of the first leg of the 2018 Tall Ships Race. The Tall Ships Sunderland event proved an outstanding opportunity for photography of sailing ships and people having fun. I visited three times to capture images depicting a broad selection of maritime-themed photographic subject matter. The Gulden Leeuw, a Dutch ship, during the Parade of Sail off Sunderland. Several of the ships were moored close to the National Glass Centre and the University of Sunderland’s Sir Tom Cowie Campus, close to St Peter’s Church. Sailing ships on the River Wear, by the University of Sunderland’s Sir Tom Cowie Campus with Wearmouth Bridge in the background. Many more were docked on the other side of the River Wear, alongside the Port of Sunderland’s Coronation Dock and further round, by the Hudson Dock. Mir, a Russian ship, the largest participating in the Tall Ships Race at the Coronation Dock in the Port of Sunderland. The ships and their crews were obvious subjects for photos, but I also photographed visiting people. Portrait photography is one of my areas of speciality. Feel free to contact me to arrange portraiture sessions, should you ever be interested in arranging a shoot for yourself, a friend, a member of your family or a loved one. Call 07947 587136 to discuss your requirements or send a message via the Contact page of this website. Tall ships on the River Wear near Sunderland’s Wearmouth Bridge. On Friday evening members of Cirque Bijou walked on an inclined high-wire from the south bank of the River Wear to a platform on Wearmouth Bridge. Members of Cirque Bijou performed a high-wire act, walking above the River Wear to Wearmouth Bridge. After the high-wire walkers successfully completed their walk fireworks illuminated the bridge, reminding me of a waterfall as dusk darkened into night. 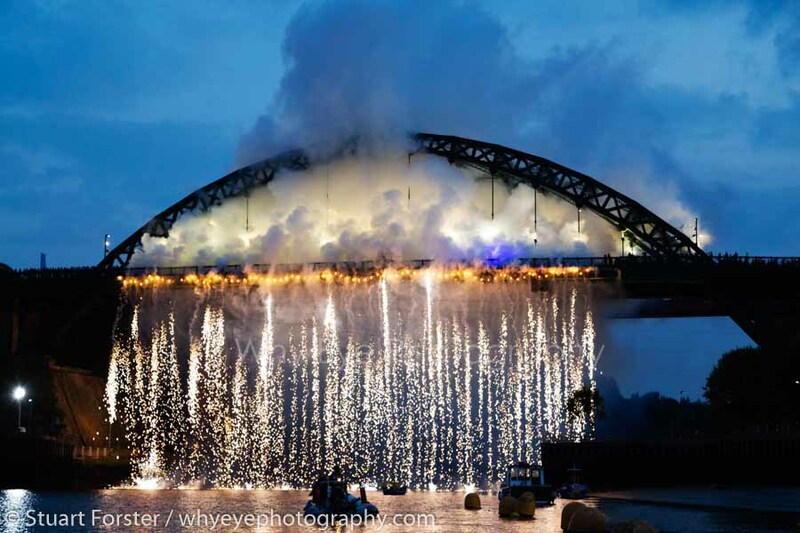 Fireworks celebrate the 2018 Tall Ships Race on Wearmouth Bridge in Sunderland. Wearside was blessed with sunshine for much of the event. Business seemed brisk at the ice cream vans parked near the waterfront. Visitors could take cruises on The Morgenster which you can see here sailin past Roker Pier at Sunderland. I chatted to several visitors while photographing at the Tall Ships Sunderland. The time spent waiting for rigged ships to sail past Roker Pier zipped by in conversation. The Gulden Leeuw sailing past Roker Pier and into the Port of Sunderland. On the afternoon of Saturday the 14th July the ships began slipping their moorings and sailing down the River Wear. Tall ships moored in Sunderland. The Parade of Sail was a joy to witness. Hundreds of people viewed the spectacular event from Roker Pier. People on Roker Pier, to watch ships sailing at the start of the 2018 Tall Ships Race, in Sunderland. I sailed out onto the North Sea on the Blueeye, a boat operated by OnWater Training, based in nearby Hartlepool Marina. Shtandart, a Russian ship, on the North Sea during first leg of the 2018 Tall Ships Race. The low perspective provided some wonderful opportunities to photograph the tall ships under sail. One of the hardest challenges was keeping the horizon straight while moving on the water. Kayakers off Roker Pier at Sunderland during the Parade of Sail. The seeing the green hull and billowing sails of Alexander von Humboldt II with a blue sky as background inspired me to photograph a series of images. The Alexander von Humboldt II, a German ship, on the North Sea. The Lord Nelson, operated by the Jubliee Sailing Trust, also caught my eye as she coursed through the water off Lizard Point. The Lord Nelson, a British ship, on the North Sea near Lizard Point on the coast of north-east England. From the starting line, 4.8 miles off the coast of Sunderland, the tall ships began the first leg of the 2018 Tall Ships Race. The made their way to Esbjerg in Denmark, a part that celebrates the 150th anniversary of its foundation in 2018. The Lord Nelson during the Parade of Sail off Sunderland. Hopefully photographers in Esbjerg, Stavanger and Harlingen also enjoy seeing and photographing the tall ships. The Morgenster, a Dutch tall ship, on the North Sea. If you are a photo editor and want to license any of the images you see on this page, please get in touch. I welcome opportunities to undertake photography commissions for new and existing clients. If you want to commission a commercial or editorial photo shoot, please call [+44 (0) 7947 587136] or email [stuart @ whyeyephotography.com]. Find out more about the tall ships’ visit to the north-east of England on the Tall Ships Sunderland website. A selection of photos by Why Eye Photography Limited illustrate this online feature on Go Eat Do, Visiting the Tall Ships Race in Sunderland. The See It Do It Sunderland website is a useful source of information if you are planning on visiting Wearside. Each July the city hosts the Sunderland International Airshow, another great event if you enjoy photography. Feel inspired and want to give sailing on a tall ship a go? It’s possible. See the Sail Training International website for more information. The Morgenster sails past Roker Pier to enter Sunderland. This entry was posted in Event Photography and tagged Maritime Photography, National Glass Centre, North-East England, Northeast England, Ship Photography, Sunderland, Tall Ships Photography, Tall Ships Race, Tall Ships Sunderland, University of Sunderland. Nice post. It’s been a while since I was in Sunderland, but this makes me want to return. The city has changed significantly in recent years. Hopefully you will enjoy getting back.